UPDATE: Due to the overwhelming response from riders, the survey will be ending Friday, November 14 at 5 p.m.
TriMet is in the process of designing a new state-of-the-art electronic fare (e-fare) system that will make riding easier and we are looking to riders to help us shape and name the system. 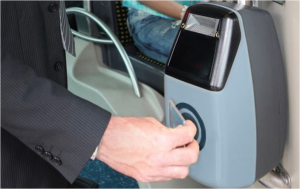 With an e-fare system, you will be able to easily and quickly pay your fare by tapping a contactless payment device like a card or phone against an electronic reader. No need for exact change; no paper ticket to keep track of; daily and monthly caps on how much you pay; and many other benefits will come with an e-fare system. TriMet is launching a short online survey to find out how riders would use the e-fare system, and get opinions on possible names vetted by rider panels. Access the survey at trimet.org/efaresurvey. The benefits of e-fare won’t stop at the doors of TriMet’s buses and MAX trains. The City of Portland, which operates the Portland Streetcar, and C-TRAN are partnering with TriMet to implement e-fare and make riding transit more convenient throughout the region. TriMet employees will start testing the e-fare system internally as early as the fall of 2015 with the opening of the Portland-Milwaukie Light Rail Transit Project. In 2016, we plan to begin offering the program to a limited number of customers for testing, with the aim to launch the e-fare system wide in 2017. The eFare system will cost up to $30 million to implement, but should pay for itself over time. It’s expected to reduce fare evasion, increase revenue, and reduce costs associated with ticket vending machines, cash purchases and collection processing. Click here for background on TriMet’s e-fare process.